Big Sky Resort is just one of the reasons Bozeman is a great ski town. Today, I’m lending my voice to the chorus. But my claims aren’t hyperbolic. They’re for real. Bozeman: The Next Best Ski Town? Let’s take a quick look at Bozeman. This small city in southwestern Montana has a population of just under 50,000 people. It’s home to Montana State University and brags of a diverse local economy tech, manufacturing, agriculture and tourism coexisting successfully. It doesn’t really sound like a ski town, does it? And yet, Bozeman sits in a high valley, surrounded by gorgeous mountains, the gateway to Yellowstone National Park and adjacent to some of Montana’s best fly fishing. Come winter, the snow falls. And the skiing near Bozeman beckons. Sounds like a ski town to me. While Big Sky has the international profile, the massive terrain and the most well-known name, the closest skiing to Bozeman is at Bridger Bowl. The skiing at Bridger Bowl is diverse, fun and surprisingly versatile. Just sixteen miles from Bozeman,Bridger Bowl has 2,000 skiable acres, 2,000 feet of lift-served vert, 350” of annual snow and the most beautiful beginner terrain I’ve seen. Last season, while we were skiing there, I shot a quick chairlift video with my off-the-cuff, full-of-enthusiasm response to skiing at Bridger Bowl. 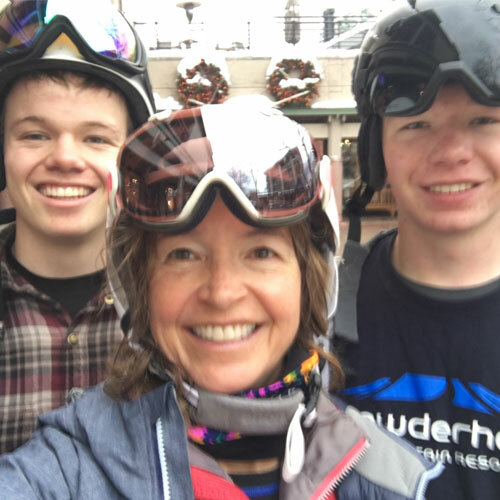 And yes, while the food, lift tickets, lessons and the like are an excellent value, especially for families, it’s the terrain that makes Bridger Bowl worth a visit. Just remember, if you want to ski Schlasman’s lift, you’ll need a beacon. About an hour from Bozeman, almost to Big Sky Resort, you’ll find Lone Mountain Ranch, a wooded enclave of 27 luxury log cabins along the Gallatin River. Come summer, Lone Mountain Ranch is a fly-fishing destination. In winter, guests cross-country ski at Lone Mountain Ranch on 85 km of groomed trail. There are also 30 km of snowshoe trail. Even if you don’t stay at the ranch, our suggestion for a perfect winter day is to cross-country ski in the morning (if you need rentals or lessons, you can arrange these at the on-site ski shop) and then enjoy a well-deserved gourmet lunch at the Horn & Cantle, one of the area’s most highly rated restaurants. Come evening, put the Lone Mountain Ranch’s Sleigh Ride Dinner on your list. If you’ve done a sleigh ride dinner at a ski resort, you may be picturing a snowcat pulled sleigh. Not at Lone Mountain Ranch. Here, teams of gorgeous work horses pull sleighs to the historic North Fork Cabin. Prime rib is on the menu, along with side dishes and dessert. The meal is prepared on a 100-year-old cook stove and oil lamps give the cabin a soft glow. It’s a family style meal and adventure topped off with entertainment from cowboy singer Bruce Anfinson, who is not only talented, but pretty darn funny, too. Please note, that while younger children might enjoy this signature Montana evening, we think it’s best for ages 10 and up. If there’s one big reason the ski world has come to recognize Bozeman as a ski town, it is Big Sky Resort. Yes, it is big. Yes, it is beautiful. And yes, the splendidly isolated Lone Peak dominates the clear blue Montana sky. Big Sky Resort is a North American “must ski” destination. I’ve written about skiing at Big Sky numerous times, focusing on how to ski the resort and how to get the most out of your visit. Rather than cover all of this again, check out these two posts for information on lodging, dining and skiing at Big Sky. Big Sky, Montana: Two People. Two Days. America’s Biggest Skiing. New for 2018-2019, Big Sky is on the Ikon Pass and the resort is opening the first eight-person chairlift in North America, the Ramcharger 8. With heated seats and room for two average families, this new lift will carry 3,200 skiers per hour up Andesite Mountain. Also new this winter are new flights to Bozeman Yellowstone International Airport. With nonstop flights to 16 cities during winter, Bozeman might be the most well-connected ski town in the west. While you may want to explore staying at either Lone Mountain Ranch or at Big Sky Resort, if you’re planning to ski at Bridger Bowl, you should definitely stay in Bozeman. Lodging rates in Bozeman are a bargain compared to many ski towns, especially if you book a “Ski and Sleep” package. We stayed at The Element last winter. The hotel includes breakfast and was comfortable and very convenient. Finally, here’s something else for the Bozeman bucket list: cross-country skiing in Yellowstone National Park. I’ve not done it yet. But I hear it’s wonderful.